It started out innocently enough. 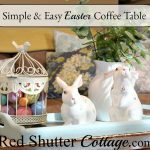 At 6:00 am on a Sunday morning, Sailor and I were sitting at our kitchen table, drinking coffee. Our son was on his way over with his friend to pick up their boat. They will often park their boat at our house the night before they are going fishing since we live close to the various boat ramps in our area. We like to be up when they arrive, in case they need help, or just to say “Happy Fishing”! I had spent the day before, and the weekend before that, on a very focused drive of editing, de-cluttering, and purging. I already had one large box and two small boxes filled and ready to donate. 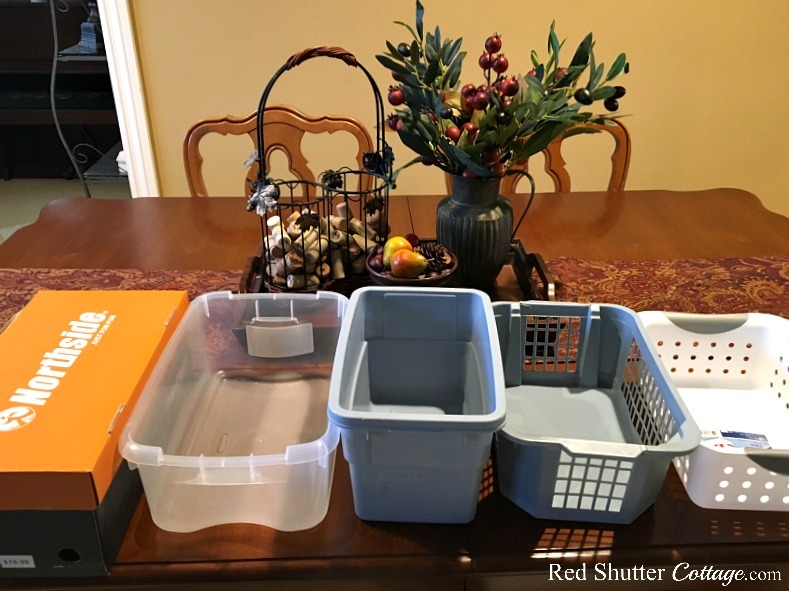 Sitting in the kitchen, I realized one of the areas I still wanted to edit was my plastic container collection. I pulled up a photo of a very organized container drawer I had on my Pinterest “Organizing” board, and I was ready to launch! 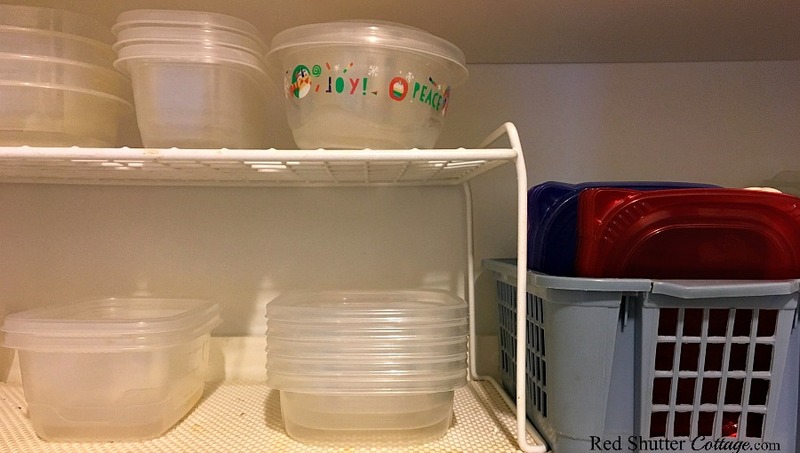 I have 3 areas where I keep plastic containers, which is probably the first clue that I have too many containers. 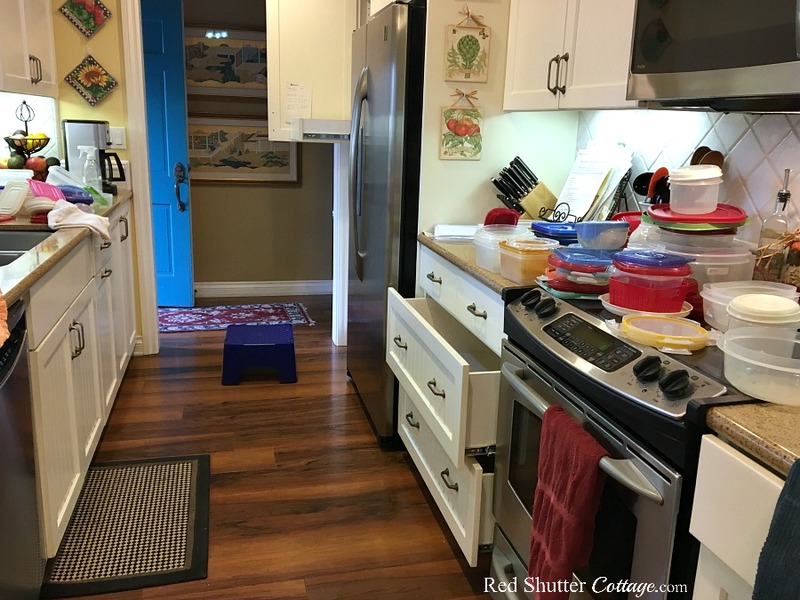 The first area is a wide shelf, the 2nd area is narrow, pull out drawer, and the 3rd area is a pot drawer next to my stove. 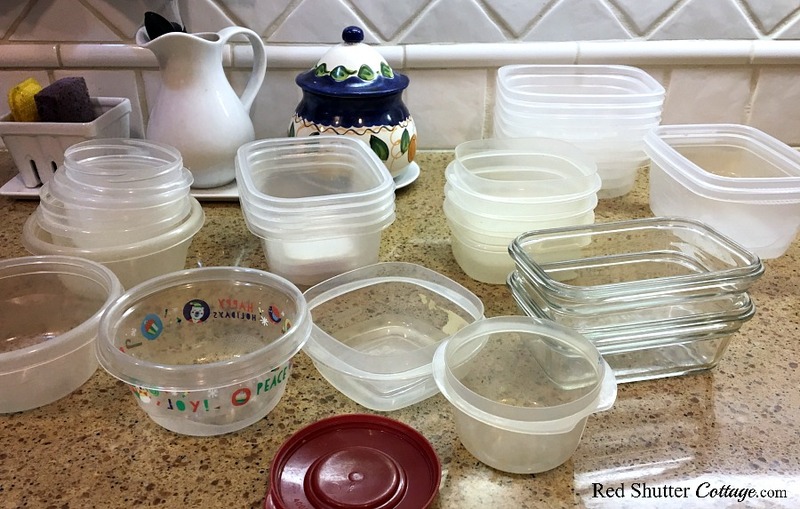 The first two areas were simply too crowded, but the containers and lids were still pretty organized. The pot drawer, however, was a disaster. For some reason, I couldn’t approach this in stages, working one area at a time. No, I had to jump in and pull every single container out. In a remarkably short amount of time, my kitchen looked like this. 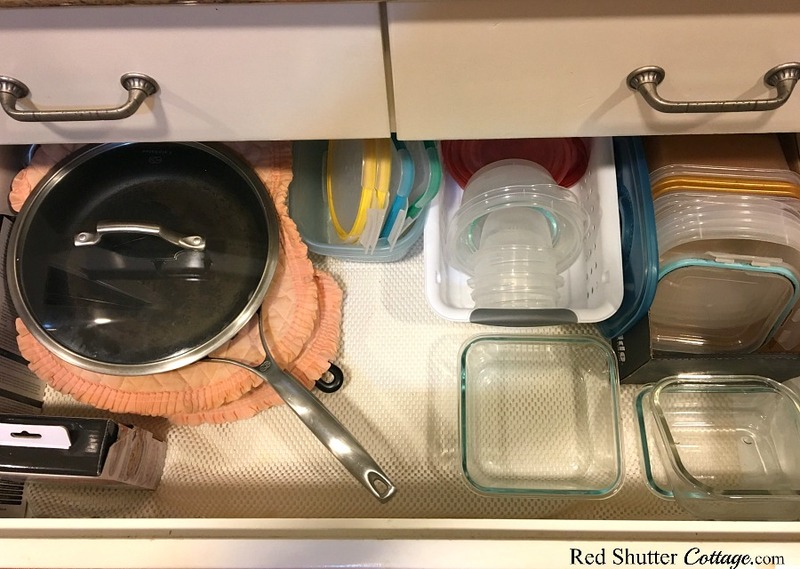 All of a sudden, all those empty areas made me I realize I needed to vacuum and wipe down the drawers and shelves, which very nearly veered off into vacuuming and cleaning ALL my kitchen drawers and shelves. I somehow managed to avoid that rabbit hole! 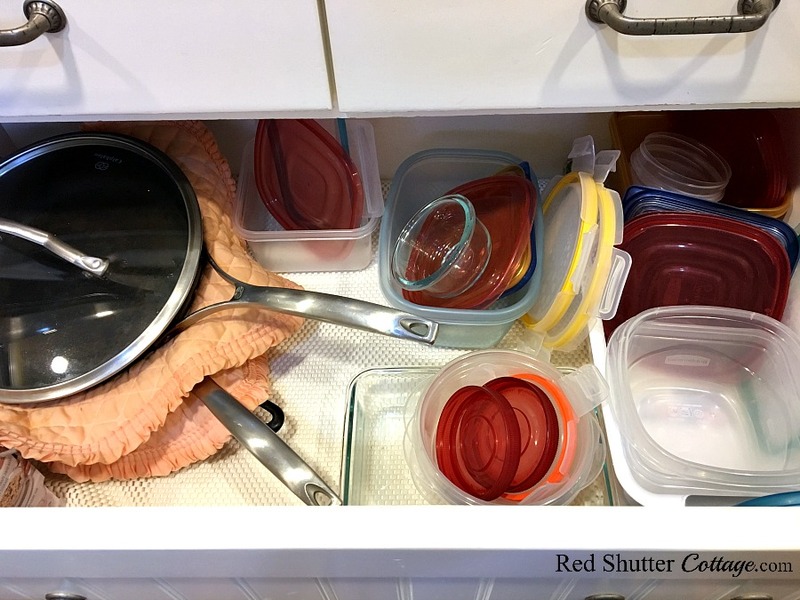 When the container drawers and shelves were sparkling and clean, I started pairing containers with lids. Slowly but surely, the lid-less containers or container-less lids started the donation pile. Then I focused on categorizing the various containers by size. I have a few of those multi-sized collections of containers (available everywhere!) so I grouped containers into their ‘families’. This opened my eyes to the fact that I do not use, and do not need, 4 or 6 sets of 3-ounce or 8-ounce or whatever-ounce sized containers. 2 or 3 sets will do nicely, thank you. Again, the donation pile grew a little bit more. 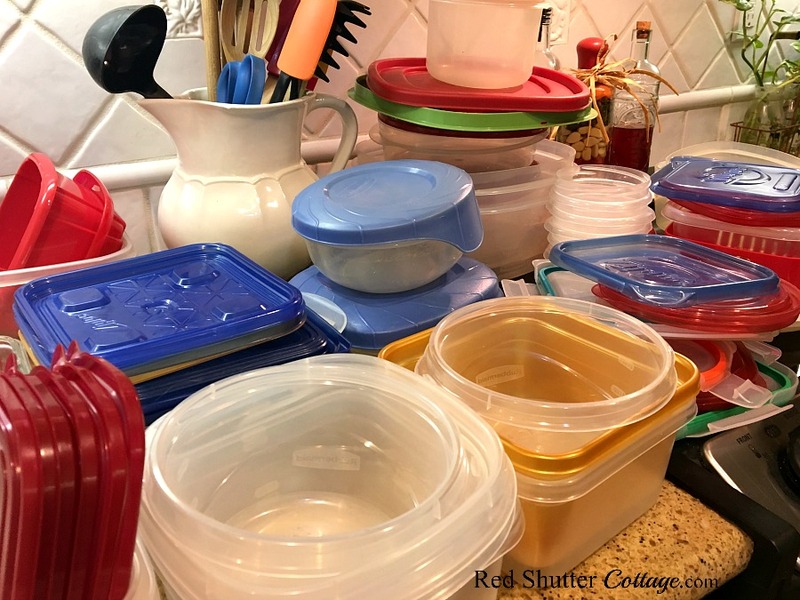 I spent the next hour editing, reviewing, deciding, organizing and re-organizing, until I felt like I had a sufficient inventory of containers that would serve as needed. I added the donation containers to the existing haul designated for the thrift store, and threw away quite a few that were stained, lid-less, or quite simply just too old. When I finished, there was such a sense of accomplishment, and it wasn’t even 9:00 am yet. 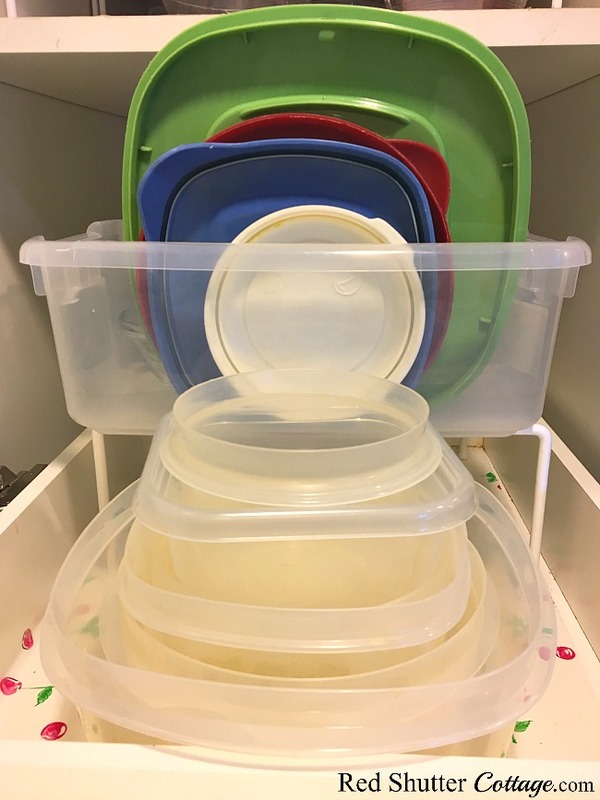 I had containers that I knew I would need and use, and I had a donation stack of nice, still usable containers that would find a new home. I even had a drawer that bore a faint resemblance to the photograph that had inspired this whole event. The pot drawer now had personality and class. The pull-out drawer and the shelf just looked a little bit neater and more organized. Here is the link to the Better Homes & Gardens photo that was my inspiration. 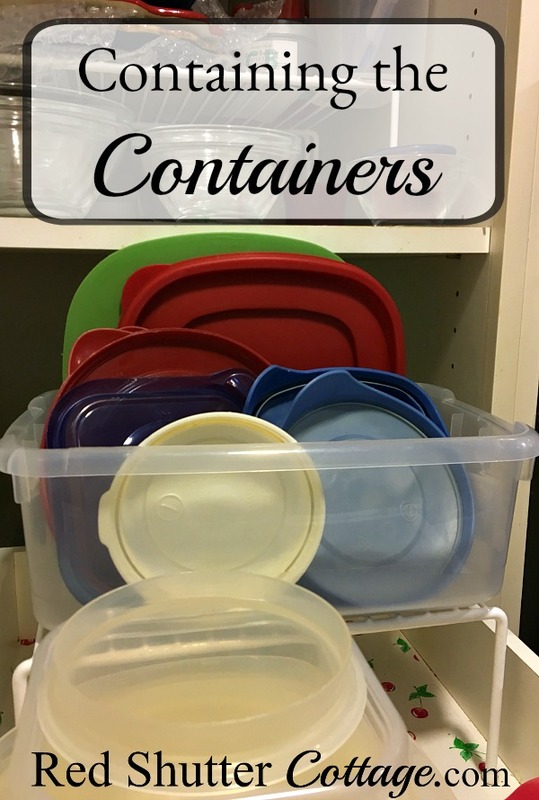 If you’re looking for ideas, examples, or just a little nudge to ‘contain the containers’, I hope it helps! 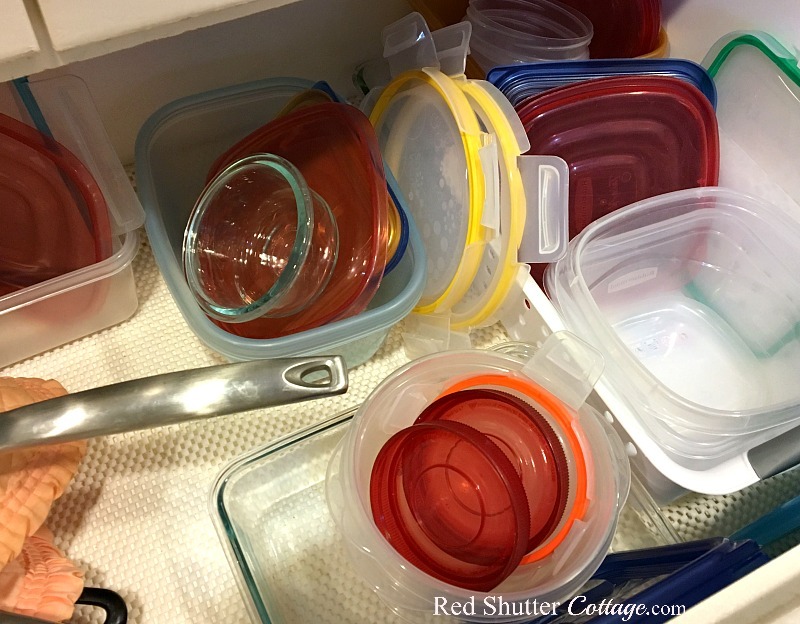 Plastic containers are so handy to own, but you really do need a system for corralling them especially those lids. Great examples here Kristine and well worth the time it took to clean it all up. Thank you Leanna! It was a great way to start a Sunday! My accomplishment meter was way up!! Surprisingly, I have been able to keep the organization in place. I think letting go of the containers I didn’t need (or weren’t worth keeping) really helps with that! Organizing containers is really a tough task. 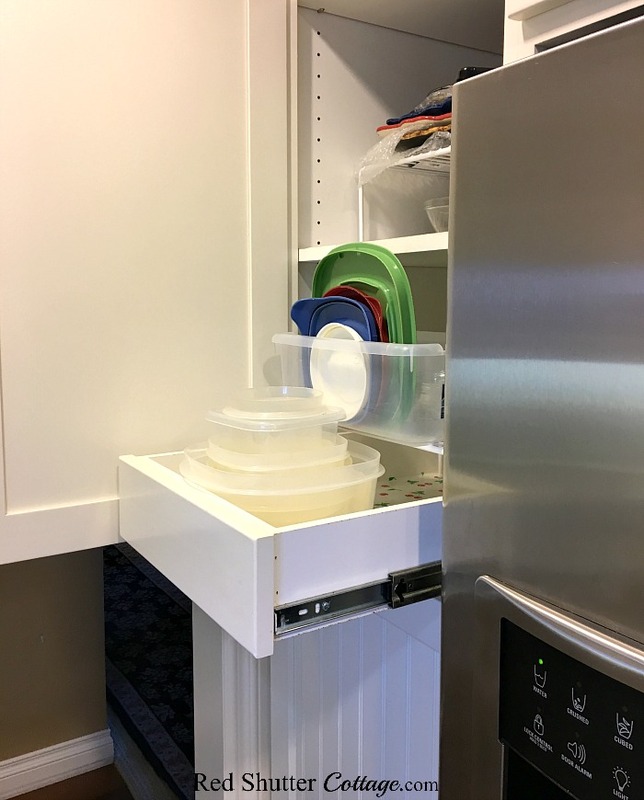 Thanks for sharing this amazing post for organizing and storing containers. It’s amazing how much easier storing and organizing is when you weed out all the useless and old items. It’s actually been pretty easy to keep it up. Thank you so much for stopping by.